The Assassin's Creed trailer shows off plenty of Spanish Inqusition themed action but there's going to be far more of a focus on modern day Assassin Callum Lynch than his 15th century dweller ancestor Aguilar. In an interview with IGN, executive producer on the movie Pat Crowley revealed exactly how much to expect in the past and the present, and it turns out that 65% of the movie takes place in the 21st century. 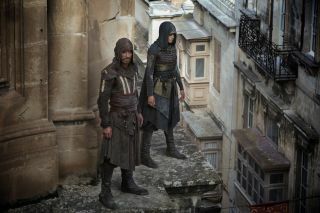 While the games have almost dropped the future aspect of things like a hot Apple of Eden-flavoured rock, Justin Kurzel and Michael Fassbender's vision focusses much more on the present day and a new team of modern day Assassins. Callum Lynch wakes up in Abstergo having been publically 'executed' as a prisoner on death row. Marion Cotillard's Sophia Rikkin assures him she's there to help him but that involves plugging him into the Animus to find out information for Abstergo. Given that there are other prisoners undergoing the same scientific testing, this means a new crew of Assassins being cultivated in the 21st century. Cue some deadly problems for the Templars. When I spoke to Jean-Julien Baronnet, now ex Ubi Motion Pictures CEO, on my visit to the Assassin's Creed set he confirmed that we would see more of Abstergo than ever before. "The modern day will be much bigger than in the game. We don’t know very much about Abstergo in the game – we know some but not much - but the movie will have more," he said. "I think it’s very important... this beautiful thing that we have in Assassin’s where you’re in the Animus and you are learning through the Animus, but what are you really? I think that we will try and achieve this on this movie, so we will see today’s hero character arc move each time he regresses, and understand from his ancestor who he is and what is his destiny." Can't get enough of the Brotherhood? You can catch up on my thoughts on the first 15 minutes of Assassin's Creed.